Testicular cancer - Important to know! Testicular cancer is a rare malignant disease. It most commonly affects men between the age of 15 and 34. Fortunately, this tumor is highly treatable even in case the tumor cells have spread to distant organs in the body. The stage of the disease and the very type of testicular cancer determine the treatment modality. All men are due to be familiar with self examination of testicles. This way they may be able to discover any abnormal growth in the testicles on time and consult their doctor if necessary. Testicular cancer occurs in a form of an enlargement or lump in either testicle. A man can also complain about a feeling of heaviness in the scrotum and there may be dull ache in the groin or lower part of the abdomen. Furthermore, the tumor may cause a sudden collection of fluid in the scrotum, pain and discomfort and in some cases there is even a chance of enlargement and tenderness of the breast tissue. And finally, patients suffering from testicular cancer may report unexplained fatigue and general feeling of not being well. The tumor usually develops in one testicle. It is not clear what causes testicular cancer. The tumor develops after normal cells of the testicle alter. Namely, once the cells change they start to develop rapidly and uncontrollably. There are certain conditions that represent risk factors for testicular cancer. They include an undecided testicle, abnormal testicle development, family history of testicular cancer, age (the tumor is more frequent among younger men) and race (testicular cancer affects white men more than black men). In majority of cases the tumor is discovered by men unintentionally or during self-examination. Furthermore, a doctor may detect a tumor during a routine examination. What follows is ultrasound of the testicles and blood test. Ultrasound can be very helpful in determining the nature of testicular lump. Blood tests are important for measuring tumor markers in the blood. 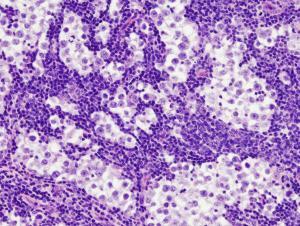 Definitive confirmation of the tumor is achieved after surgical resectionand pathohistological examination of the tumor. Treatment for testicular cancer depends on the type of cancer, the stage of the disease and the overall health of the patient. Testicular cancer is treated with surgery and chemotherapy. Even radiation therapy may be performed in certain types of the cancer. Surgery for testicular cancer is quite radical and is the primary treatment modality for almost all stages of the disease. In some cases even inguinal lymph nodes area removed. Surgery is the only treatment modality in early stage of the disease. In advanced stages patients are additionally treated with chemotherapy. Furthermore, chemotherapy is very effective in case of metastatic spread of the disease. And finally, radiation therapy is only administered in case of nonseminoma type of testicular cancer since it is not effective in other types of the tumor. What Could A Bump On The Testicle Be? Can papaya leaves help in curing lungs cancer?